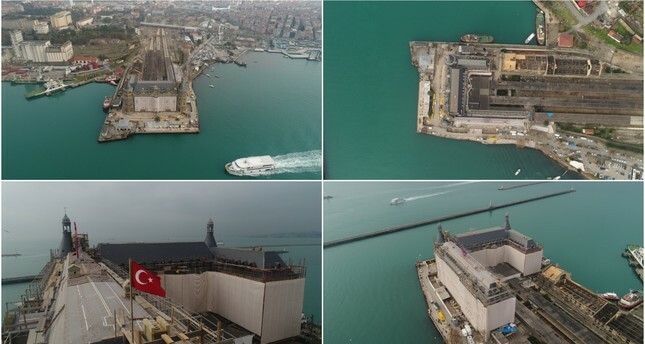 The restoration work on the roof of Istanbul's landmark Haydarpaşa Train Station which was damaged in a fire that broke out in 2010 has been completed, reports said Wednesday. The Haydarpaşa station — named after the neighborhood where it is located on the Asian side — caught on fire in 2010, leaving its towers and the roof heavily damaged. Restoration works were launched after the incident, and the work on two towers was completed in recent months. The roof and the towers, which were restored in accordance with the original structure, were paved and slated. The woodworks of some parts of the roof which were not affected by the fire but rotted due to heavy rains were also renewed. The restoration is not the first repair work on the historical building. On the contrary, the 147-year-old train station has gone under plenty of upgrades. On the first day of its opening, another fire broke out at the station and it was only reopened on Nov. 4, 1909 after a restoration process. The building was used as an armory during the War of Independence and World War I, but was sabotaged on Sept. 6, 1917, when the armory exploded. The station completely collapsed after that. On the 10th anniversary of the founding of the Turkish Republic, the station was rebuilt to its original state and a comprehensive restoration was also carried out in 1976. Built by the German-owned Anatolian-Baghdad Railways and designed by architects Otto Ritter and Helmuth Conu in the first decade of the 20th century as Europe's gateway to the east, the station was a terminus of the Istanbul-Medina-Damascus railway line and later for routes to Anatolia. The station had also long served as the terminus for trains coming to the commercial capital from Anatolia. In 2013, Haydarpaşa was closed as part of the Marmaray project, which foresees the renovation of the old suburban rail system and stations and the addition of an extra track for high-speed trains to reach the iconic station, along with a rail tunnel crossing the Bosporus that was opened for service the same year. The Haydarpaşa Train Station is expected to return to service when the station's renovation and other features of the Marmaray project are completed. Archeological excavation works have been continuing in and around the station area as well, where plenty of findings belonging to the late Roman, Byzantium and Ottoman era have been unearthed.